Not everyone can enjoy sugar-laced treats especially when there is a holiday such as a Birthday, Christmas, Easter and even Valentine’s Day. There are however some amazing sugar-free peanut butter squares that I want to share with you today that I adapted from a recipe I found online. My wife no longer consumes sugar and with Valentine’s Day coming up I wanted to surprise her with something sweet that I knew she would love. She’s a peanut butter enthusiast even though I’m not the biggest fan I must say that these sugar-free peanut butter squares are pretty amazing. It’s important that you buy unsweetened, no-salt peanut butter for the recipe. Peanut butter traditionally has quite a bit of sugar so make sure you read the labels carefully. How much sugar is in peanut butter? Even though your sugar-free peanut butter is only crushed nuts you will still have 1 gram of natural sugar per tablespoon (15g) and 3 grams of carbohydrate. If you can buy organic peanut butter that is unsweetened and just crushed peanuts…even better. You’ll pay around $5-6 a jar. The coconut oil we use is Grace premium virgin coconut oil which is cold pressed and one of the best out there. You can find many brands of coconut oil on the market but make sure you buy cold-pressed and virgin coconut. Coconut oil has so many uses including skin moisturizer, hair moisturizer, baking, cooking and so on. A 500ml jar will cost around $8.99 unless you buy organic coconut oil where this will cost you a few dollars more. My wife likes either or… whichever is on sale. The chocolate topping on my peanut butter squares is optional but a no-brainer for me because my wife loves chocolate. Mixing coconut oil with unsweetened cocoa will actually harden up like chocolate dip on a cone from Dairy Queen. It’s brilliant and you can even make chocolate nut bark with the coconut oil and cocoa. I sweetened the chocolate as well with Splenda because it’s just too bitter without sweetness. Every 1 tablespoon of cocoa is equal to 3 grams of carbohydrate. The original recipe comes from the Sugar-Free Mom but she calls it a 3 ingredient peanut butter fudge. Honestly, she’s done an amazing job with this recipe but it tastes nothing like fudge to me nor does the texture remind me of a fudge. It tastes exactly like the ingredients suggest, peanut butter squares similar to eating a thick Reece peanut butter cup or one of my chocolate peanut butter balls. What I did different from the original recipe was I added in unsweetened coconut to the peanut butter because my wife loves coconut. The 2 tablespoons I used in this recipe of unsweetened coconut is equal to 5 grams of carbohydrate. I also thought it would be nice to have a bit of texture to the squares. 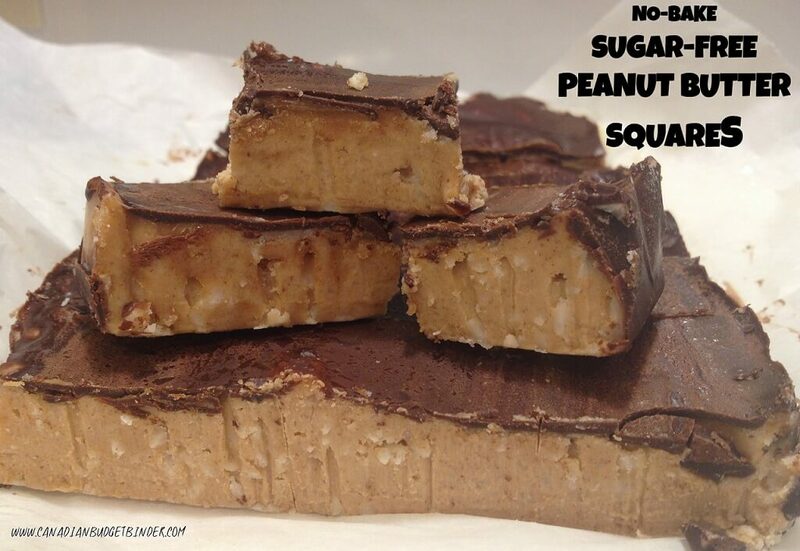 You can leave the peanut butter squares without your sweetener of choice or add it in if you like a sweet flavour. Personally, it tastes great with a bit of sweetness. We used Splenda (1 gram carbohydrate per packet) but if you have Stevia, Xylitol (4 grams carbohydrate per packet 4g) or any other natural sweetener that would work as well. Keep in mind that the carbohydrate count may change depending on what sweetener you use. Don’t worry I had to look it up too! Xylitol is naturally found in low concentrations in the fibers of many fruits and vegetables, and can be extracted from various berries, oats, and mushrooms, as well as fibrous material such as corn husks, sugar canebagasse and birch. It’s amazing how many carbohydrates are in the foods we eat, not to mention sugar. Now that my wife has done the Atkins diet for the last 4 months I’ve read labels religiously. I’m working on lowering my carbohydrate and sugar intake just because it’s healthier for me. I hope you enjoy these treats and if you are making them for someone who can’t have sugar I’m sure they will enjoy them even more than you will making them because they are so easy to make. Not everyone can enjoy full fat treats with sugar so I wanted to create something that was delicious with texture and lots of sweetened chocolate on top. I think these sugar-free peanut butter squares are on-point with or without the optional ingredients. In a small pot add your coconut oil and peanut butter to melt then add to your food processor with the almond milk, coconut and sweetener. Once the squares are set make the chocolate coating by melting in a pot on the stove-top until combined and pour over top the entire pan then freeze again for another 1 hour. We found that frozen was best to enjoy them but if you don't like them cold you can simply refrigerate them. As mentioned you can store them in the freezer so they are nice and cold when you enjoy them which is what my wife likes the best OR you can refrigerate them. Honestly they just melt in your mouth from frozen and it’s hard to eat just one. With a total carb count of only 20 grams a day my wife has to make sure she portions her fat bombs as they are called in the Atkins world to 1-2 every day or so. If you are worried about using the almond milk you can substitute it for full-fat cream. Each one of these sugar-free peanut butter squares without chocolate, coconut or sweetener will be around 2 grams of carbohydrate. I’d add 1 more carbohydrate if you do add the chocolate, coconut and sweetener per square. It’s easy to do the math depending on what you add in so don’t be afraid to read your product labels.